Vestil SPS-HD-2252 Steel Hi-Duty Stockpicker Truck, Shelf Size (WxL): 22"x52"
model: SPS-HD-2252, Description: Hi-Duty Stockpicker Trucks, Steel, Bottom Shelf Size (WxL): 22"x52", Shelf Clearance: 13.5", Top Shelf Height: 35", Capacity Per Shelf: 500lbs. 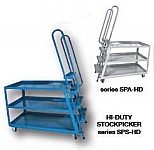 model: SPS-HD-2852, Description: Hi-Duty Stockpicker Trucks, Steel, Bottom Shelf Size (WxL): 28"x52", Shelf Clearance: 13.5", Top Shelf Height: 35", Capacity Per Shelf: 500lbs. 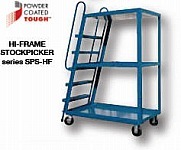 Vestil SPS-HF-2252 Steel Hi-Frame Stockpicker Truck, Shelf Size (WxL): 22"x52"
model: SPS-HF-2252, Description: Hi-Frame Stockpicker Trucks, Steel, Bottom Shelf Size (WxL): 22"x52", Shelf Clearance: 27", Top Shelf Height: 63", Capacity Per Shelf: 500lbs. Vestil SPS-HF-2852 Steel Hi-Frame Stockpicker Truck, Shelf Size (WxL): 28"x52"
model: SPS-HF-2852, Description: Hi-Frame Stockpicker Trucks, Steel, Bottom Shelf Size (WxL): 28"x52", Shelf Clearance: 27", Top Shelf Height: 63", Capacity Per Shelf: 500lbs.